← Do Catholics Worship Mary and the Saints? 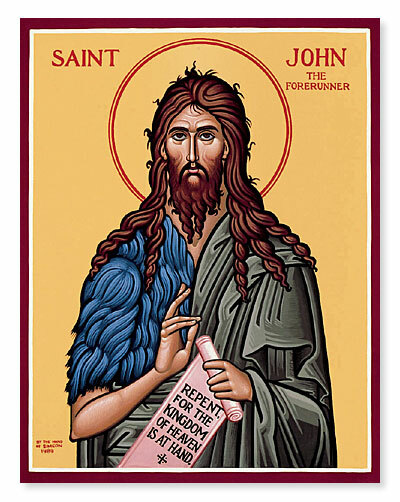 On this feast of the Birth of St. John the Baptist we celebrate the Birth of the final Prophet of the Old Testament. He stood at the culmination of the Old Covenant and emphatically pointed to the New. He drew back the curtain on all that that the ancient prophets longed to see. His birth is a great harbinger of a new epoch, the final age of Man. When he points to Christ and then steps back, we see the Old Covenant yield to the new. One era is ending another is beginning. This birthday bespeaks a coming sea change, something is ending, something greater is beginning. Types, symbols and shadows are about to give way to true reality they signified. A great and dramatic moment in this Old giving way to the New occurs when the two meet by the riverside. (It is true, they had already met in utero, as Mary and Elizabeth shared company. John prefigured this riverside meeting by dancing for joy in his mother’s womb at the nearness of Christ). But the drama of this moment at the riverside cannot be overestimated for John supplies a strange and wonderful answer to a question asked 2,000 years before. And the answer he supplies to this question signals that the new has arrived. This entry was posted in Saints and tagged Catholic, John the Baptist, Saints. Bookmark the permalink.